"Antioch Life Park Cemetery, formerly the American Memorial Park Cemetery, is an historic cemetery of the City of Grand Prairie, Texas. Antioch Life Park has been serving the Grand Prairie community and surrounding environs since 1881. The new name reflects upon the history of the early cemetery while incorporating a sense of celebration for those who are, and will be, buried there. 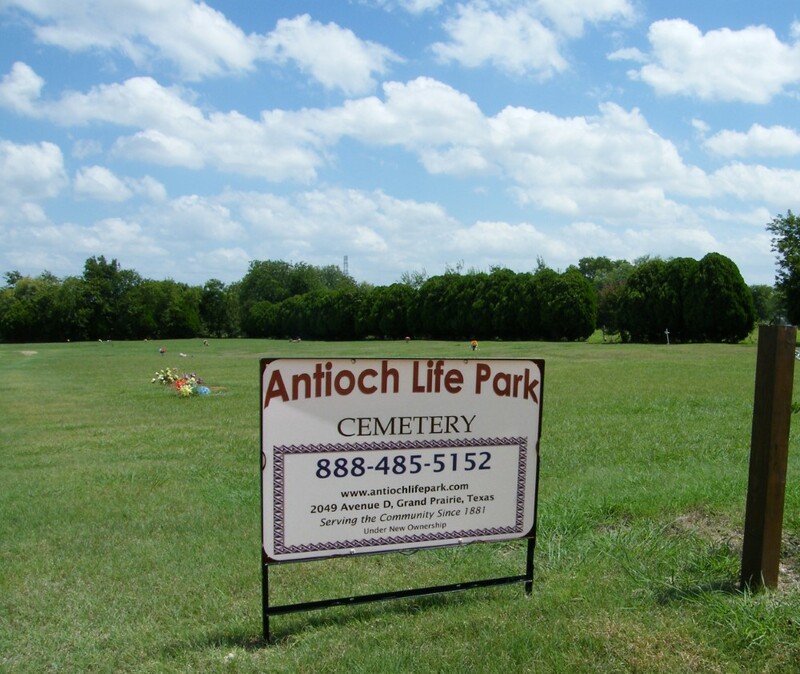 Under new ownership and management beginning March of 2016, Antioch Life Park renovations will remake it as an active cemetery and provide an alternative for those seeking a final resting place for their loved ones." Information provided by Thom Aldredge to Regina Shumaker for use by the Grand Prairie Genealogical Society. American Memorial Park Cemetery was recorded in February and March 2011 by GPGS volunteers: Carol Franklin, Howard McCalla, Rena Yarach, Ben Grimes, Lynn Shumaker and Regina Shumaker. In October 2012, the cemetery was walked again and new tombstones were added by Lynn Shumaker and Regina Shumaker. January 2011, Lynn and Regina Shumaker went to a funeral home in Dallas and viewed a map of American Memorial Park layout. Pictures were taken of the map because it was a large wall map and could not be copied. The map was not up to date but did have two basic "named Sections"...Garden of Peace (north of drive) and Garden of Devotions (south of drive). Graves were mostly east to west in orientation but interspersed with small groups of north to south graves. This made it difficult to come up with a row and lot number plan. We ended up simply using rough divisions of the above gardens; i.e. : P1, P2, P3, D1 and D2. 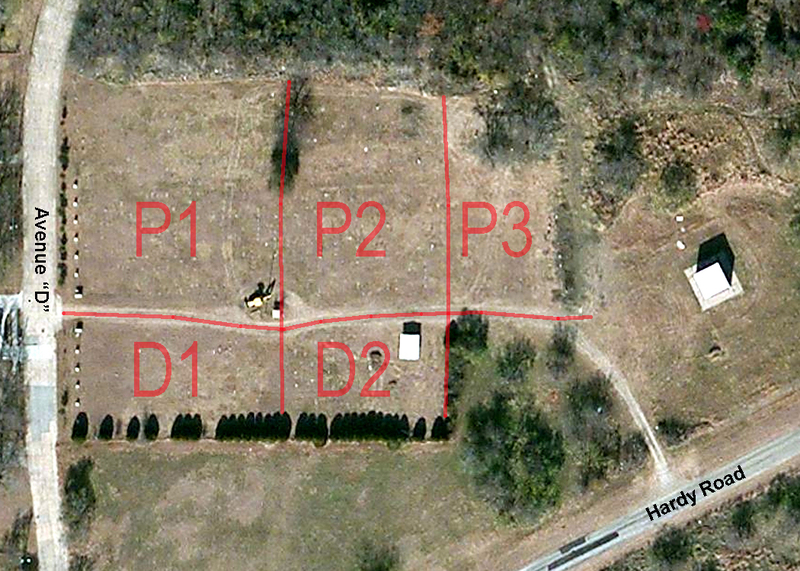 Please see the picture of the aerial view with the divisions in red. The Antioch Cemetery was established in 1881 when 200 acres were sold to Charles O'Donnell with a provision that 1 acre be reserved by Mrs. Eugene Long for the purpose of fencing a cemetery and building a Catholic Chapel. It appears from land records that this little cemetery near the shores of Mountain Creek Lake was at one time at the end of American Memorial Park and has over the years become a part of it. According to the land records in Dallas County on November 16, 1891, H. M. Moore was grantor of the property to the Antioc Baptist Church. These land records indicate that ". . . one half acre and more fully described lying on the Dallas and Fort Worth Road and being on south side of said road and being on the A. Cockrell 320 acre survey and being one acre east and west and one half acre north and south containing one half acre of land; said Antioc Baptist Church has a church building on said half acre of land (Trustees – H.M. Moore, W.M. Alexander, L.G. and B.F. Jordan); said land being for church purposes." Since H. M. Moore was a Trustee of the Antioc Baptist Church, and again the grantor along with the Antioc Baptist Church of the property to the Live Stone Lodge No. 152 on February 3, 1904, it is assumed that the church was officially disbanded or merged with another church about that time. A church history was not found to verify this. The survey included all graves in both the Antioch Cemetery and the American Memorial Park Cemetery as the dividing line was very indistinct. Because there were not any definite lots or rows, and the lots were scattered indiscriminately, they were left out of the land survey. The many changes of ownership over the years, made it impossible to accurately document the history of this cemetery. ITEMS FROM Grand Prairie Significant Landmark posting.